This tutorial demonstrates how to use Rule Extensions	in a Rule Engine	. 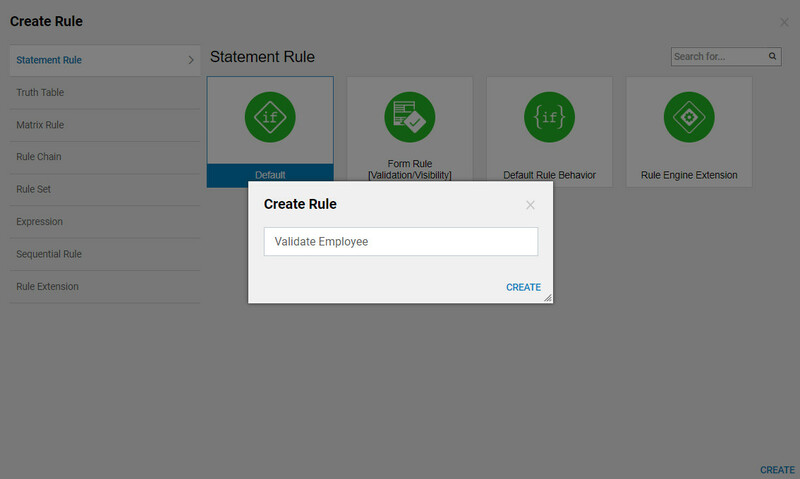 A Rule Engine Extension	allows you to create aRule	that can be embedded in another Rule. 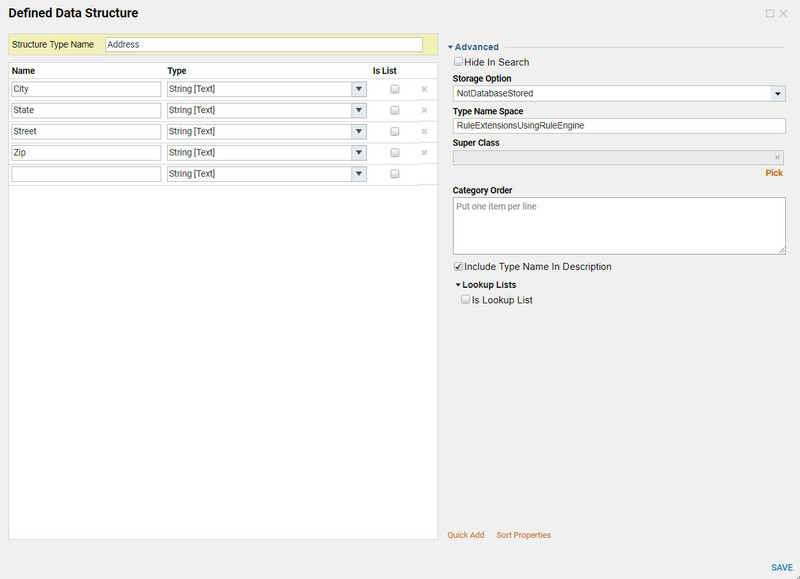 It is required to add “anchor” Input	in the “Main” Rule in order to use Rule Engine Extension. This*“anchor”* Input should be the same Type	of Data	that Extension Rule	has as its Rule Input Data. 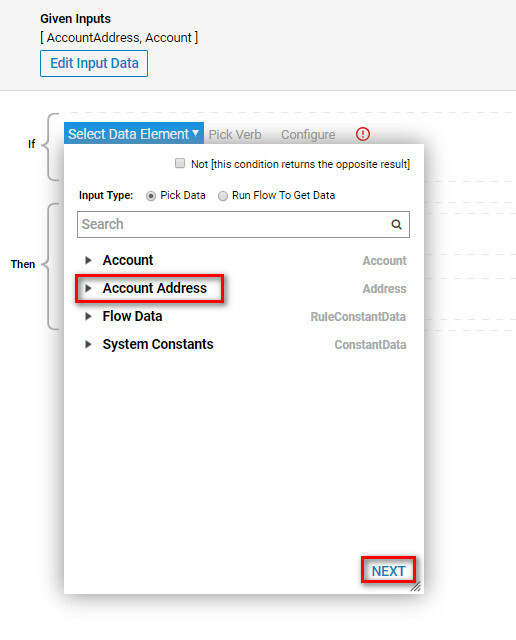 In this example, create a Flow that should validate "if the Account in the Portal belongs to the Decisions Employee? ", and then, display all Accounts that passed this validation. In order for the Account to pass validation, it should contain decisions.com	in theEmail Address field	. 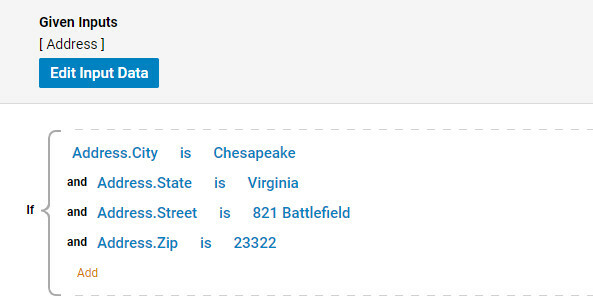 Additionally, it should have a specific Address in the Contact Info,	because Address is a complex Data Type, create aRule Extension	that checks if the Address is valid for the Account. First, we need to create a Defined	Data Structure . In theDesigner Folder	select Datatypes/Integrations > User Defined Types > Defined Data Structure	option from Folder Actions. Name the Defined Data Structure Address	and add four Data Names	. Select Save	to save and close Add DefinedDataStructures. Next, create an Extension Rule	. 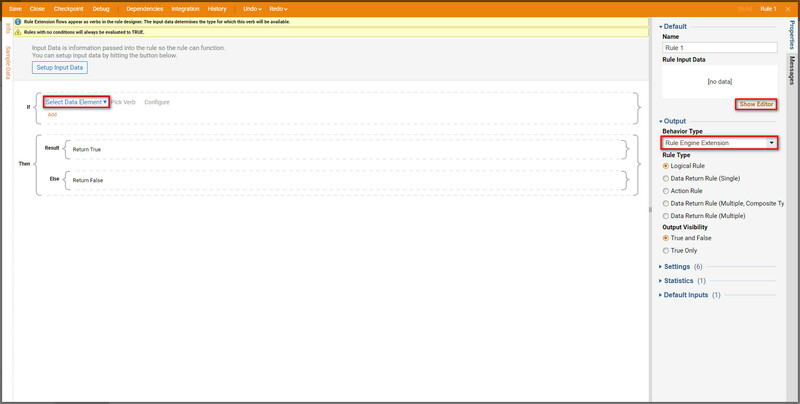 In the designer Folder navigate toCreate Rule >Statement Rule	and selectRule Engine Extension. Next name the Rule and proceed to the Rule designer. Locate the Properties Tab and in the Output	settings under the Behavior Type	select Rule Engine Extension	. In the Rule designer Select Data Element	to choose Rule Input Data. Select Show Editor to Add Rule Input Data. Name	the Input and select Address Data Structure	that we have created for this tutorial as its Type	. Select Close	to save and continue. Add a Rule Phrase for each of the Data Members in the Address Data Structure . When the Rule Phrase is complete it will accept Address	Data and return True	if all Data Members match the desirable Address	. We can save the Rule	and close Rule Designer. 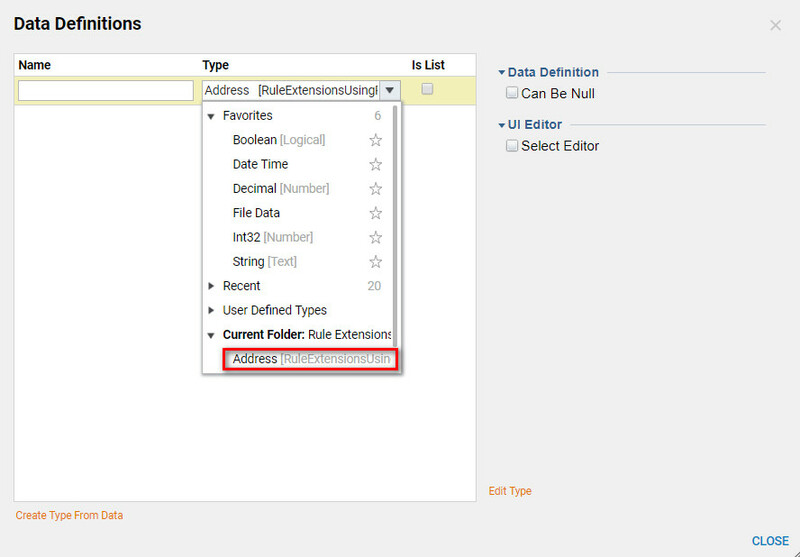 Next, create the "main" Rule that will use anExtension Rule. In the designer Folder select Create Rule > Statement Rule	and S	elect Default. 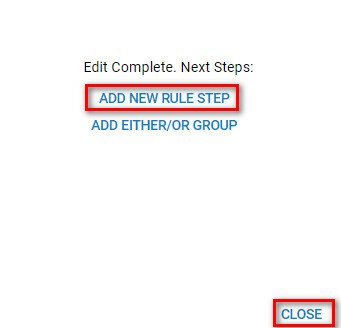 Then, Name	the Rule	and select Create	to proceed to the Rule Designer. In the Rule designer's Properties Tab in theDefault	Section underRule Input Data	selectShow Editor	and add Rule Input Data	(Data Definitions) to the Rule. 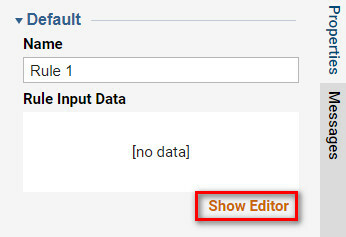 Create a Data Definition calledAccount Address	for theRule Input Data***	. 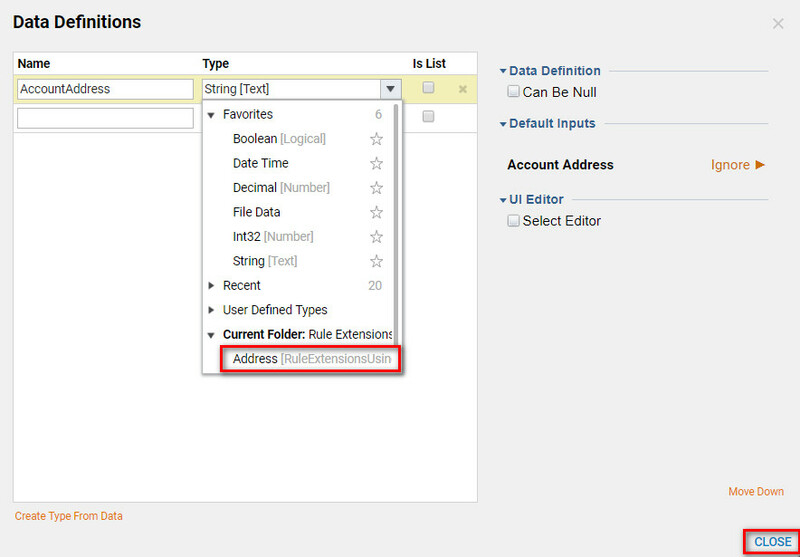 The Rule Input Data	(Account address) should be the same Type	as the Input Data	for theExtension Rule*	(Address [RuleExtensionUsing]).The Rule Input Data	will be an “anchor” for the Extension Rule. Select Close	to save and continue. In the Rule designer begin building the Phrase Builder. Choose Account Address	“anchor” Input Data	and select Next	. 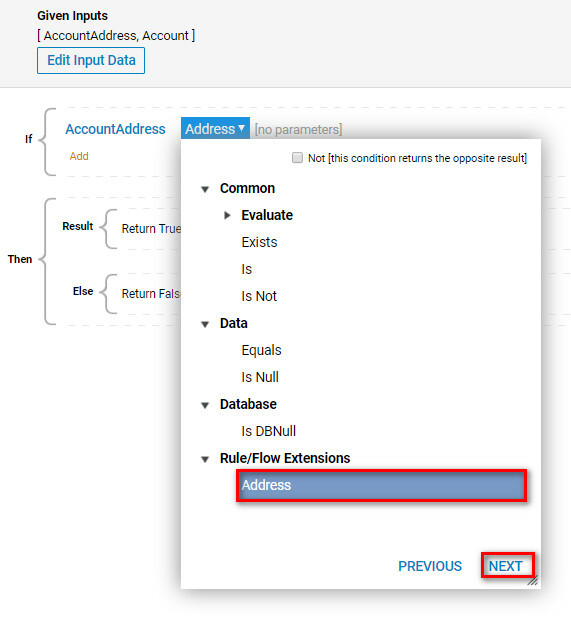 Next to Account Address Pick Verb,	expand Common>Rule/Flow Extensions	(Account Address). Next, in Pick Verb expand Rule Engine Extensions	and pick theExtension Rule	as a verb	for this Rule Phrase . Select Next	to continue. TheExtension Rule	does not take any additional Input Parameters, therefore we select Done	to complete this Rule Phrase. 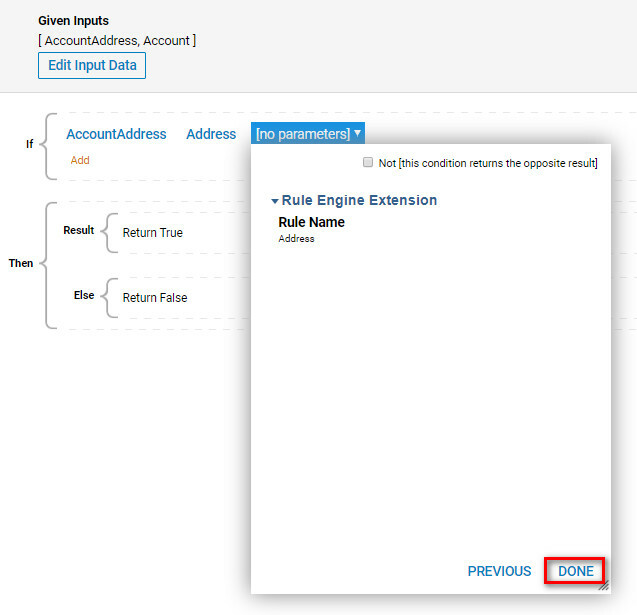 When the Rule Phrase	is run or built into a Flow it will run the "Main Rule	" using the Rule Engine Extension	as its Parameters	. This complete the example on how to create a Rule Engine Extension that is embedded into a Rule.